I just have to rave about these 5 short novellas by Francine Rivers. There are 5 women listed in the geneology of Jesus as written in Matthew 1. For some of these women, the bible only has short mentions of their lives, but obviously God has chosen to use them to bring His Son into the world. Francine Rivers has incorporated her amazing gift of historical fiction storytelling with excellent research into the customs of the bibilcal times to create books that you can hardly put down. I have finished 4 of 5 of them, and I’ll be headed to the library for Unshaken, the story of Ruth, tomorrow. I feel like I see the stories of these women in very different ways, and their lives seem to have much more relevance today. 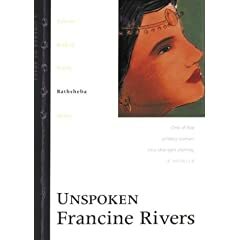 Most recently, I finished reading Unspoken, the story of Bathsheba, which was an insightful look into a woman who is mostly thought of as an adulteress who seduced King David. But the story made me see her in a new light, as a woman who received unlimited grace after giving into weakness, and she raised her sons to fear the Lord. I give these books TWO THUMBS UP, and I highly suggest them for a very easy, most insightful read. There is even a bible study and devotional in the back of each book. Enjoy! #1 – Unveiled: The story of Tamar, a woman of hope. #2 – Unashamed: The story of Rahab, a woman of faith. #3 – Unshaken: The story of Ruth, a woman of love. #4 – Unspoken: The story of Bathsheba, a woman who received unlimited grace. #5 – Unafraid: The story of Mary, a woman of obedience. What’s Analise up to these days? Analise loves bathtime, splashing and playing with her toys. The other day, I was watching her and she tried to stand up, but squatted down. When I reached down to pick her up and sit her back down I found a few “logs” floating!!! Yuck! Brian came running at my holler. I cleaned Analise off, and he disinfected the tub and toys. Analise was a bit disappointed that her bathtime had been cut short. While my mom was here, Analise had a personality explosion! My mom took the time to write down all the things she is up to, and it’s quite a list. Words she’s saying: “Daddy”, “uh-oh” (probably the most frequent), “mm-mm-mm”, “oooh”, “num-num”, “no-no-no” (not used as the actual word, I don’t think, but when she really really really wants to communicate something). She’s trying to say lots of words, and she chatters all the time. It sounds like she’s speaking Japanese fluently. She rocks in the rocking chair, stands in it, sits her stuffed animal in it and rocks them. She balances things on her pull toy to give them a ride. She says “uh-oh!” when they fall off. She pretends with stuffed animals and dolls, sitting them in high chair or strollers, trying to put clothes on them. She started snuggling, hugging and kissing her stuffed animals. She kisses pictures of animals in books. She loves books. She spends a long time pulling books off the shelf, turning them right side up, turning the pages, before going onto another book. She loves to bring you books to look at with her. She is particularly into lift-the-flap books and pop-up books. She dances when she hears music, and she’s started walking backwards and sideways. She straddles and sits on the soccer ball and then bounces on it a bit. She enjoys pretending to talk and listen on an old cell phone. Favorites: Stuffed gorilla, pink and white penguin, Baby Einstein DVDs, cuddling with Mom before a nap, balls, plastic tubs or boxes to sit in, lasagna, any kind of beans, bananas, peanut butter and jelly sandwiches, watermelon, teddy grahams, ice cream and string cheese. Just wanted to ask for all of our friends to be praying for us and for the residents of Alabama, Mississippi, and Louisiana tonight and tomorrow night. New Orleans sits 12 feet below sea level and the storm surge is expected to be 20+ feet. If you do the math, it’s easy to see that you could drown in a three story house — even if the house isn’t washed away. 40 MPH WITH GUSTS TO AROUND 60 MPH. CHANCE OF RAIN 100 PERCENT. This is the fourth tropical storm that will blow through Alabama this summer. That’s not even including Hurricane Ivan from last year which stranded us while looking for houses in Birmingham. The airport was closed for a few days because of the storm. For all of you checking in for Analise pics, these are especially for you. Analise has been quite busy trying to ride her rocking horse lately (above). She stands next to it, lifting her leg up, trying to get on herself. She’s pretty excited when someone stands there and rocks her. Below, Brian and I were all dressed up for a Samford Faculty dinner at The Club, a classy member-only dining club overlooking Birmingham. I enjoy the perks of being a professor’s wife! It was a fun (free!) evening out. My favorite project was taking white, wooden letters, about 4″ high that spelled her name, and using scrapbooking stickers to decorate them, and hanging them with pink ribbon. I’ve had these for a while, and I was itching to do something with them. I’m excited at how it turned out! We also hung the quilt that came with the crib set (spontaneous purchase off Ebay a long time ago, that again, I was itching to put up). It’s hung with pink ribbon as well. Mom made a nice yellow gingham curtain for around the changing table to cover all the clutter. We found a nice scarf to drape as a curtains, tied with a pink ribbon. The front window didn’t need much, because it’s got stylish plantation shutters, but the whole room looks better with window treatments. The last touch that didn’t quite get finished is a string of chenille hearts to hang across the top of the windows in front of the scarf swag. Mom took them home to finish since we ran out of time with all our little projects. It was our own version of Deisgn on a Dime or one of those fun HGTV shows that mom is always watching (and I would, if I had cable). I’ve been really busy lately trying to get our church’s home church ministry organized. It will be called ONE ACCORD, and right now, it’s a big hit with over 50 people meeting WEEKLY at 3 different homes. It’s a great opportunity to experience real community and grow with others on a deeper level than the usual Sunday experience. With groups that big, one of my tasks has been to divide. It’s stressful… I’m a people-pleaser, and I’m so afraid someone will be disapointed. We’re also trying to nail down the invisible details of how we’re going to do things. We’re basing our ministry on a very successful home church ministry at North Point Community Church, detailed in the book Creating Community. It’s exciting but overwhelming to try to put it all into practice. As I’ve said in other posts, our home groups, both here and in California, have become our second families. We’ll have a kick-off event on September 7th to bring everyone together and lay out all the details, so I’m sure you’ll hear more about ONE ACCORD in the future! Brian made a funny discovery with Analise’s little Leap Frog Alphabet Pal. It’s a caterpillar with a letter on each leg, and it plays various things for the different modes – letter name, letter sound, color, etc. As Brian was playing letter sounds together to make words, the thing said, “Hehe! That tickles!” We realize that it won’t play the sounds for A and S together… probably to prevent it from saying bad words. There are a few others combinations it won’t play either. Funny -and sad – that toys have to be that smart. Brian just took off for a weekend with the guys from church in Mobile, AL for the Promisekeepers rally. He attended the event in California 2 years ago and had a great time, so I’m sure he’ll really enjoy himself and the fellowship this time, as well. One of our friends from church who is also husband-less for the weekend is coming over for a night of scrapbooking. Woohoo! For your evening reading… The Campus Confession Booth. Leave me a note if you have any thoughts about it! You can’t beat having your mom around. I mean, at a certain age, it’s not preferable, but when you become a mom yourself, it’s great to have another mom to mom your baby. My mom arrived in town the day we came back from California. It’s her first visit to Alabama, and we’re having a great time in spite of the 90 degree weather (with heat indices over 100). Last week, we visited the Birmingham Zoo with a friend of mine and her daughter. We saw the sea lions get breakfast. The flamingos were all posing right by the fence, so we got up close and personal with them. We took a train ride around the zoo and saw all the places we haven’t visited yet (we have a zoo pass, so we do the zoo in shorter blocks – it’ll probably take us another couple visits to see all the animals). The favorite parts, though, were the Lorikeet Aviary and the Butterfly Encounter. The Lorikieet Aviary was a small house filled with beautiful little birds, just slightly bigger than parakeets. They flock to you, especially if you have a little cup of nectar that you can buy right outside. They land all over you – from your hand, fighting over the nectar, up your arm, and probably in your hair. My mom had 10 on her at one point! One even settled on Analise’s head! She loved the birds:) The Butterfly Encounter is another small building filled with flowers and bushes. There are hundreds of butterflies flitting around. You can get right up close to photograph them. It’s very beautiful. Have you guessed by the lack of pictures that we forgot the camera? Sorry! But we’re definitely going back to see both of those again, so I’m you’ll see pictures eventually. Right now, my mom is working on painting Analise’s room. We’re having a great time redecorating it – from a bright mint green to a new clean light yellow. We’re going to hang a pretty quilt on the wall, hang wooden letters that spell out her name, and hopefully find some pretty window treatments. It’s going to look great – I’m so excited. Mom’s working on the third coat, though, and she wouldn’t have tackled this if she’d known how much work it would be. Again – pictures to come soon! Last night, Analise saw her 2nd baseball game in just over a week. Brian had free tickets to the Birmingham Barons AAA baseball game, courtesy of Samford. We even had free hot dogs, chips, cookies and drinks. We were in an air conditioned box high up on the 1st base line with great seats. It was a great time! Lots of fun perks for faculty at Samford! It’s so nice to have my mom around! I love my mother-in-law, and I really appreciate how wonderful it is to be close to her. But it’s so sweet to have this extended time for my mom and Analise to enjoy each other. Our recent trip to California was wonderful. I think that flying out there (on frequent flier tickets – woohoo!) made a huge difference, as we were really able to just relax and hang out. The Biggs’ and Haffly’s were great hosts, and we got to appreciate Corrie’s awesome cooking all weeklong. A true vacation for me! My super traveler – Though she came down with an ear infection the night before we flew out, Analise was fine with some tylenol and slept for most of all 4 flights. She sprawled out across Brian and my laps. It’s hard to hold a sleeping baby for that long, but it’s sure easier than dealing with an unhappy one! Did I mention she’s been to 24 states in her short 13 month life? Office space – Thursday was lunch at my old office, the UCDMC Emergency Medicine department (By the way, I redesigned this website!). Analise was a bit grumpy due to no morning nap and the ear infection. But it was fun to visit with my old friends, Jennifer, Maria and Alida! Trader Joe’s – Two trips to my favorite grocery store in the ENTIRE world, Trader Joe’s. If you’ve got one near you, you gotta check it out. Particularly, the chocolate peanut butter pretzels, pineapple salsa, pita chips, Two Buck Chuck wine (Charles Shaw) and Brian’s new favorite, the triple mocha espresso. Come on over – A potluck party at the Biggs’ where we caught up with everyone who could stop by. That was so nice to have everyone come to us! We closed out the evening with a rousing game of charades. Can you imagine acting out “Nanoelectromechanics in Engineering and Biology”, “Mein Kampf” or “The Latin Vulgate”? Neither can I… the ladies got creamed. We were up against some serious players! Apples to Apples – A fun game that Anna and Hal introduced us to and we couldn’t resist getting for the Biggs household to enjoy. Very fun! Catching up – Lunch(es) with my old co-workers, Molly and April. I’ve missed them! That’s about it from our adventure in California. We love our Californa friends… Life in Alabama is great, and we’re making awesome new friends here, but our friends in California shared a special time in our lives – newly married, newly pregnant, newly parents. You can’t help but bond with the people around you when you go through all that in just over a year! One last thought, even though very few people are probably still reading. We’re so blessed with friendships. We’ve visited so many friends (and family) this summer, and I’ve been literally moved to tears several times thinking of the amazing people who share our lives. If we got to visit you this summer, I’m so glad! If you weren’t among those we had the privilege of visiting, we miss you! You are all counted among our richest blessings. We consider ourselves so rich in relationships – I don’t think there’s much more valuable on this earth! Thank you for being a part of our lives. Better sign off before I get weepy thinking about all y’all… G’night! Here’s a crazy story about a lawsuit against ABC’s Extreme Makeover: Home Edition. The March 27th episode highlighting a Samoan family that had taken in 5 orphaned African-American children, giving them a 9 bedroom, 5 bath, 4278 sq. foot house. The Higgens children allege that they were exploited by the Leomiti family and used for to draw the attention of ABC. After the new house was built, they say they were pushed out of the house with physical abuse and racial name-calling. How sad and crazy. I definitely remember this episode, and of course, it’s all heart-warming per ABC’s 1 hour show. It’s hard to imagine a family could do that to kids who’ve lost their home and parents. All this alleged by E-Online through the LA Times, anyway. We just got back from an awesome, relaxing vacation in California. After all of our trips this summer, Analise has been to a total of 24 states! Analise has been a great traveler. She slept on most of the plane trips on our trip to California, but on one leg of our trip we were able to let her sleep on an empty seat between us. When she wasn’t sleeping, she was happy to watch Baby Einstein on our laptop while sitting in mommy’s lap. Yesterday we had a fantastic day driving to the Pacific coast and hiking in Muir Woods and Mt. Tamalpais State Park. Steve and Corrie joined us and we kept a relaxing pace, with Analise happily keeping her eyes on everything from her vantage point in Brian’s backpack. We had a nice lunch of pita sandwiches along the trail, and Corrie took a series of really nice pictures of Analise and I.